Happy Halloween to you! I thought my US readers might be interested in knowing about Halloween in France. Halloween is not a holiday historically celebrated here. It's only in the last few years that Halloween has started to make a controversial appearance. Many French feel it is a commercially generated holiday that has no historical basis in French culture – Holiday globalization if you will. Most French don't understand the concept, or what is being celebrated. Children don't trick or treat from door to door, and there's just a very small display (compared to the States) of Halloween merchandise in stores. Historically, this time of year has been celebrated in France as La Toussaint – a celebration of two similar holidays on the first and second of November. The first of November is la Fête des saints (All Saints Day), a Catholic holiday, where families honor deceased relatives by putting chrysanthemums on their graves (given this negative association, you don't give chrysanthemums as gifts in France). The second of November is la Fête des morts (All Souls Day), which is the day most other countries honor the deceased, but as the second of November is not a public holiday in France and the first of November is, most people go on the first. There's a long vacation break for school children at this time too – two weeks this year. And now on to my project . . . I made these two Halloween treat bags for friends. I used a free template from Free Digital Scrapbooking's website. I chose to fill it with a paper design from Cajoline Scrap. I cut out the template and inked the edges in Distress – Spiced Marmelade and Walnut Stain, then assembled the bags. I took a Waco Pearl Maker pen and dotted the pearls on the handle. The first base paper is vintage sheet music, inked with Distress ink and ran through my Zutter Distrezz-it-all machine. What a great little machine! When you want to distress several things it's a real time saver. 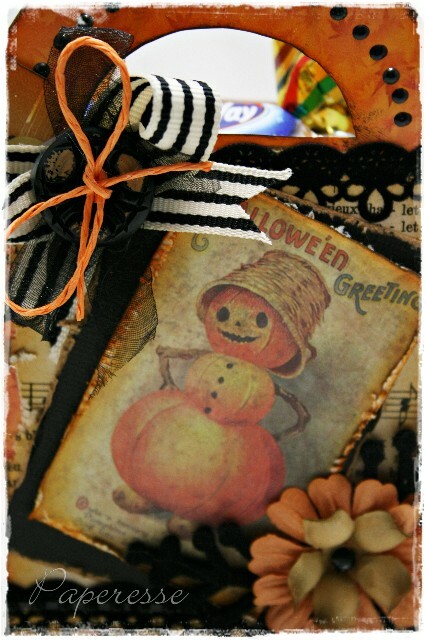 The focal point images are from Tim Holtz's Idea-ology Seasons paper. I cut them out, inked and distressed the edges. 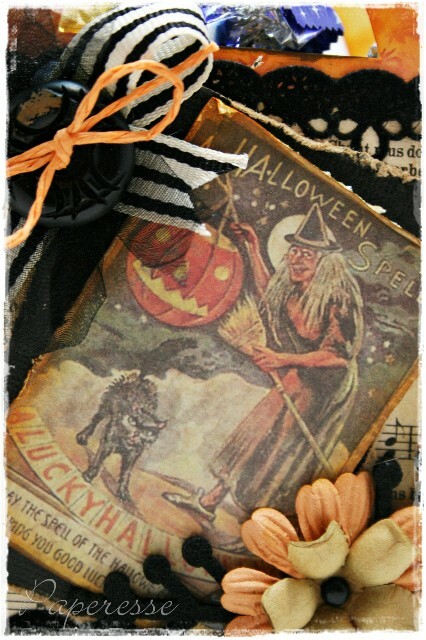 The black paper behind them is also Tim Holtz, this time Kraft Core. The black ribbon is a self-adhesive one from Folia. It has a velvet feel to it, very nice and so easy to apply. There's also a string of Kaiser Craft black pearls along the bottom ribbon, although they don't show up well in the photo. The tag is from Basic Grey's Perhaps tag die sheet. The black felt leaves are from Toga. The flowers are from Artoz and Artemio with a Kesi'Art brad in the center. The striped ribbon is from Making Memories Sophia collection, the other is vintage, as is the button. The stamp is from Verve. Ah, and the candy in the bag? Chocolate . . . of course. 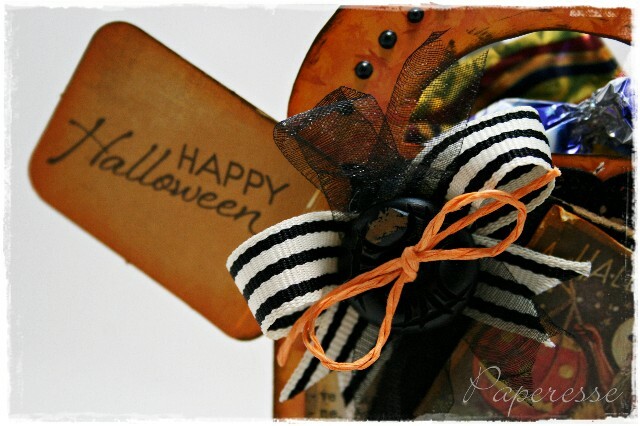 Paper – Cajoline digital, Tim Holtz Idea-ology Seasons and Kraft Core, vintage sheet music, Basic Grey Perhaps tag. Stamp – Verve Happy Halloween. Embellishments – Making Memories Sophia ribbon, vintage ribbon, paper twine, vintage button, Kaiser craft pearls, Artoz and Artemio flowers, Toga leaves. Speaking of treat bags, I love yours. 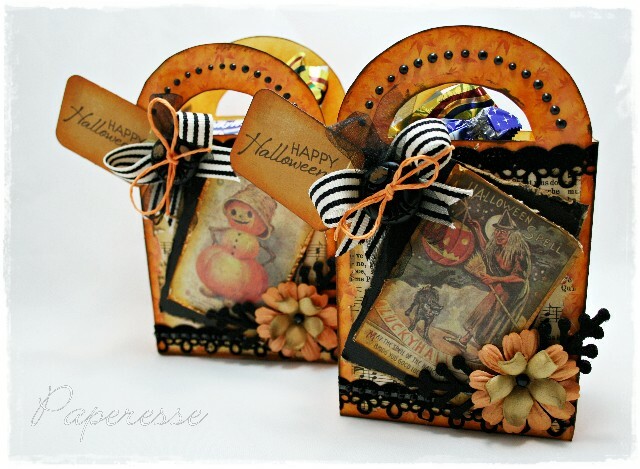 Those images are perfect and all the embellishments are fantastic!